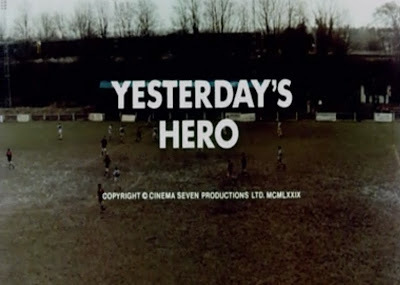 In 1979, Glynis Barber played a supporting role in her second feature film, Yesterday's Hero. The movie is not very well remembered today and majority of reviews you come across range from lukewarm to negative. However, after viewing Yesterday's Hero I can safely say that it is a pretty good movie and certainly not as bad as some critics have said. Yesterday's Hero stars the awesome Ian McShane as a former soccer star who has become an alcoholic. He gets a shot at returning to the big time and has to try to quit drinking. At the beginning of the movie, McShane is sleeping with the lovely Glynis Barber. He inexplicably ends his relationship with this woman so he can pursue a former lover, an improbably named pop signer named Cloudy. Cloudy is played by Suzanne Somers, who looks like a haggard drag queen compared to the beautiful Glynis Barber. Glynis Barber's role in Yesterday's Hero is fairly small (she only has three or four scenes in the film), yet the actress is quite memorable in this early role. The movie itself is purely for fun, even beyond the charming demeanor and attractive appearance of the young Barber. Some have derided the songs performed by Paul Nicholas and Suzanne Somers, but they are really just fun, energetic pop/disco tunes that help give Yesterday's Hero a fun vibe.